Shopping is just the worst at any time of year, let alone over the Christmas period. However I'll admit I find it a little less horrible when I'm prepared. Yep, I'm one of the 65 percent of Australians who research purchases on a digital device before venturing in-store. I can then be in and out of the shops as quickly as possible (though it doesn't always go by plan!). So please, especially over the Christmas period, while I'm queuing in your store — distract, entertain or educate me! Did you know that consumers overestimate how long they have been waiting in a line by 36 percent? And digital signage reduces perceived wait times at the checkout by as much as 35 percent! I think we can all do the math on that one. Digital signage is a key enabler to reducing perceived wait times, which is especially needed over the holiday season. Depending on your digital signage installation, you can use it to entertain your consumers, simply distract them and even educate them. Plus, digital signage near the checkout has been proven to increase sales, with 7 out of 10 consumers upsold by a digital screen that caught their eye. Great for shopping centers, interactive digital solutions can entertain consumers of all ages. An interactive Christmas experience can give parents the opportunity to sit and have a coffee while their children explore an interactive wonderland. 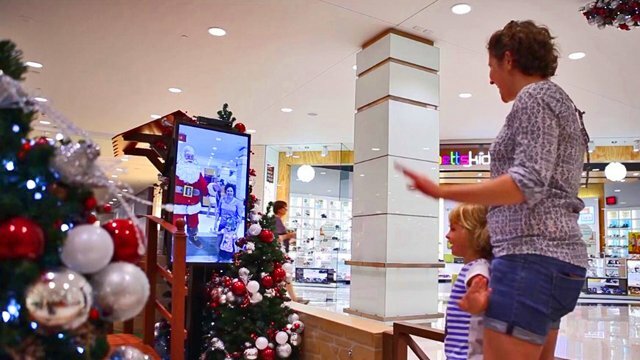 Digital signage can also let parents take a photo of their child enjoying the Christmas experience, and email it to themselves in the form of a Christmas card, for instance. 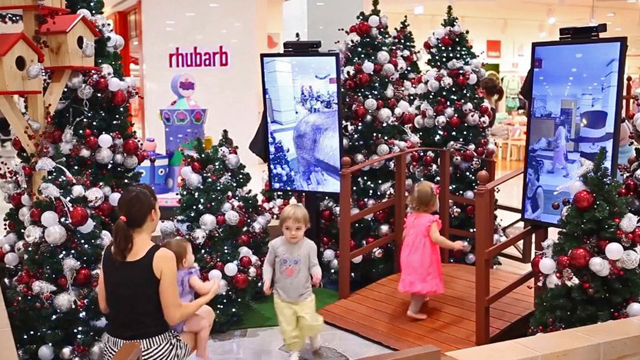 Another type of digital solution perfect for calming the Christmas crowds in a shopping center, or for relieving those who need a break, is interactive games on digital signage, using augmented reality, gesture control or even mobile interactivity. These are perfect examples of how you can entertain your consumers over the holidays. Don't we all know that occupied time feels shorter than unoccupied time? Time flies when you're having fun, right? … Or when you're being distracted by marketing messages on digital signage. Now I don't mean distract your audience with static, boring advertising. Seeing the same three static advertisements on rotation is not going to suffice. It's vital that any advertising on your digital signage features good content. Once retailers have good content sorted, four in five have reported to have experienced significant increases of up to 33 percent in additional sales through the use of digital signage. Placement is also key when wanting to drive sales (and who doesn't? ), so you need to consider the layout of your store. Do you need to attract more foot traffic in-store? Place digital signage in your window. Do you need more upselling opportunities? Place it near the checkout. There's a lot more factors to consider when installing digital signage; I recommend contacting a professional digital solutions provider to find out what will suit your store. With the ability to be updated in real-time, digital signage gives retailers the opportunity to display relevant, important messages to their customers. For example, you may have a flash sale between noon and 3 p.m., in which case your digital signage can be updated then and there to inform your audience. Alternatively, you could display the local news, time, weather or your social media feeds. This also provides your customers with relevant information as they shop. If you're not a fan of entertaining your consumers with interactive games, distracting them with sales messages or educating them with news and social media, then all you need to do is keep it simple. Focus on the ambience of your store, rather than those direct solutions. An ever-changing atmosphere, seamlessly integrated across your digital displays can assist in passing the time by for those waiting in line. Digital signage is a key factor to reducing perceived wait times, and Christmas is when retailers need to implement it as best they can. Help me out, as a consumer — create ambience, entertain, distract or educate me!